This dissertation is about the nature of the relationship between language and Theory of Mind (ToM, the ability to understand other people’s mental states). Does the development of language in.uence the child’s ToM development or is the child’s understanding of other people’s mental states crucial in the development of language? Each of the chapters in this dissertation attempts to address this question by focussing on children’s ToM development in relation not only to their linguistic capacities in a general sense (e.g. general vocabulary and understanding of syntax), but also to their understanding of language that relates to mental states more directly: “mental” language (e.g. understanding of mental state verbs and indirect requests). This dissertation investigates this relationship in three- to six-year-old children, in typically and atypically developing populations, in correlational and longitudinal studies using not only traditional or standardised assessment materials, but novel methods of testing as well. 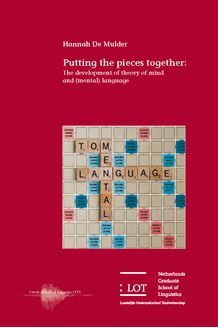 The main .nding of this thesis is that there is a complex developmental relationship between language and ToM, with bi-directional relations between some domains of language and ToM, but unidirectional relationships from other domains of language to ToM. More speci.cally, this dissertation demonstrates that although ToM and both general and mental vocabulary are bi-directionally related (ToM in.uences vocabulary development and vocabulary in.uences ToM development), the child needs a certain level of general language ability at the sentential level to develop ToM. However, a post-hoc nding suggests that understanding of locative prepositions may be an important prerequisite for ToM development as well.